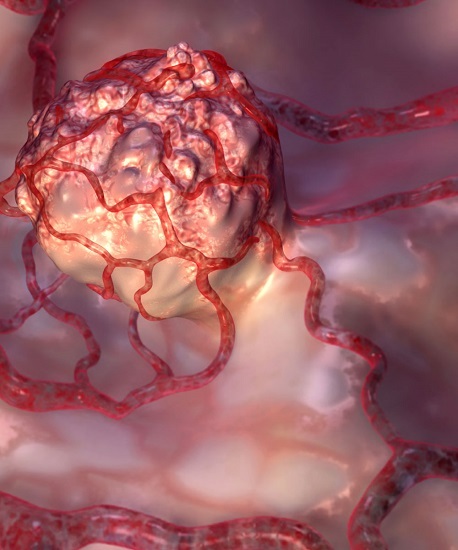 Researchers map protein pathway involved in brain tumour stem cell growth. Glioblastomas are a highly aggressive type of brain tumour, with few effective treatment options. Moffitt Cancer Center researchers are one step closer to understanding glioblastoma development following the identification of a key protein signaling pathway involved in brain tumour stem cell growth and survival. Brain tumour stem cells are believed to play an important role in glioblastoma development and may be possible therapeutic targets. The neurotrophin protein pathway controls nerve growth, survival and specialization. The researchers report that the neurotrophin pathway is also involved in the survival and growth of brain tumour stem cells. The stem cells have high levels of neurotrophin receptors called TrkB and TrkC. Cellular signals from normal brain cells can activate TrkB and TrkC on the stem cells and stimulate cell growth. And when scientists inhibited TrkB and TrkC, they found decreased stem cell survival. This suggests that TrkB and TrkC may be possible drug targets for stem cells in gliomas and glioblastomas. This work might be a first step in developing new treatment approaches targeting brain tumour stem cells. It may also partly explain why brain tumours can grow so quickly since proteins from the surrounding normal brain might be used by the tumour to grow even faster. The team also reported a potential reason why several clinical trials targeting a protein called EGFR in glioblastoma patients have failed to live up to expectations. EGFR is frequently activated in glioblastoma, but results from trials using EGFR inhibitors showed little or no patient improvement. The team discovered that TrkB and TrkC maintain brain stem cell survival and growth even when EGFR inhibitors are used. These observations suggest that one reason why EGFR inhibitors may be ineffective in glioblastoma is that TrkB and TrkC are active, thereby bypassing EGFR inhibition and allowing stem cells to continue to grow. This is the first time that scientists have shown that TrkB and TrkC are involved in brain tumour stem cell growth. Currently, no drugs that target TrkB and TrkC have been used as brain cancer treatments. The researchers hope that these results might encourage the development of drugs that target both the stem cell compartment and the more differentiated parts of the brain tumour and result in more effective therapies.